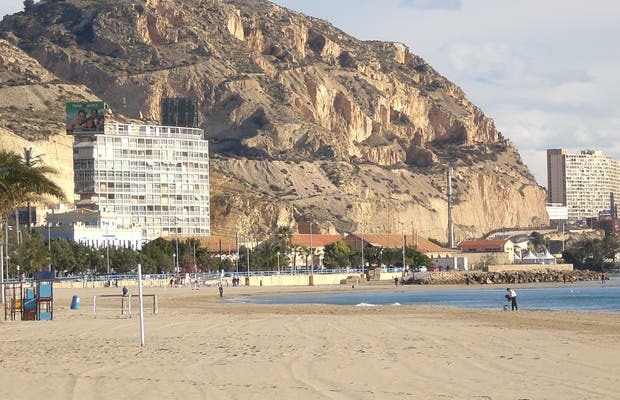 This lovely beach is located in the city of Alicante, specifically, just to the north of the Port of Alicante. It is incomparable; it’s located right in the heart of Alicante in the shadow of the Castle of Santa Bárbara. The beach is lined with palm trees and lots of vegetation and is basically an icon of the city. At the east end of the beach near the Marina and the Sangueta neighborhood, you’ll find the Cocó beach. It’s a wonderful place because it’s where they set up the fire castles and the famous bonfires on the Night of St. John. This beach is always packed in the summer, and pretty busy in the winter months as well. Once the temperatures start to raise, people begin to head to the beach, even in January and February. There’s a “summer” beach atmosphere pretty much year round. It’s located inside the city. It’s well maintained and protected by buildings and the mountain where the Santa Barbara castle lies, which help to stop the cold winds. The views from the bay are awesome, especially at night. A great place to sunbathe, especially during the winter because of the calm, peaceful atmosphere you’ll find from December to March, without the overcrowding found during the summer months. It’s close to the Albufera and San Juan beaches, as well. A train, or train via, heads out from Postiguet beach towards Denia, passing the coastal towns in between, including Benidorm, Atlea, etc. With great areas to swim and plenty of beach to find a good spot to lay out.